One of the things that this mom is trying to do for herself is to continue to lose the 'baby weight' and now that I am no longer breastfeeding, it is important to make sure I'm eating the right size portions and getting the right measurements in my recipes! 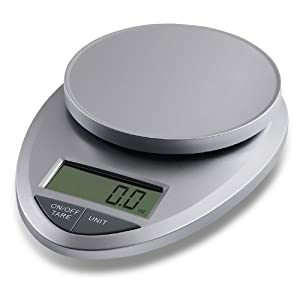 EatSmart Precision Pro - Multifunction Digital Kitchen Scale w/ Extra Large LCD and 11 Lb. Capacity as part of Mother's Month! What I love about the scale is that it is simple, clean and elegant looking on the counter and is simple to use and easy to clean! It also comes with an extensive booklet that details portion size and calories for tons of everyday foods, so you are able to calculate the calories of your servings with just a quick multiplication of the factor from the book and the weight from the scale and it's easy to weigh things on a plate or in a bowl, because the tare button lets you zero out the scale as often as you like! It is so sensitive that it can even pick up to the 1/2 gram! I received the EatSmart Precision Pro in silver, but it comes in a wide array of colors to match any decor. It's small enough to tuck away in a drawer if you'd like, but fashionable enough to stay out on the counter for use at a moment's notice. Although I've been using my EatSmart Precision Pro Digital Kitchen Scale for counting calories, it has also been invaluable as a baking tool - my recipes are so much more precise when I can weigh the flour and other ingredients instead of just relying on volume measurements! Do you like the EatSmart Precision Pro Digital Kitchen Scale enough to want one? You can buy them on Amazon.com, directly from EatSmart and from other online retailers! Right now, you can get one for the special price of just $25! Visit EatSmart Products and tell me something you learned or what other product you'd like.